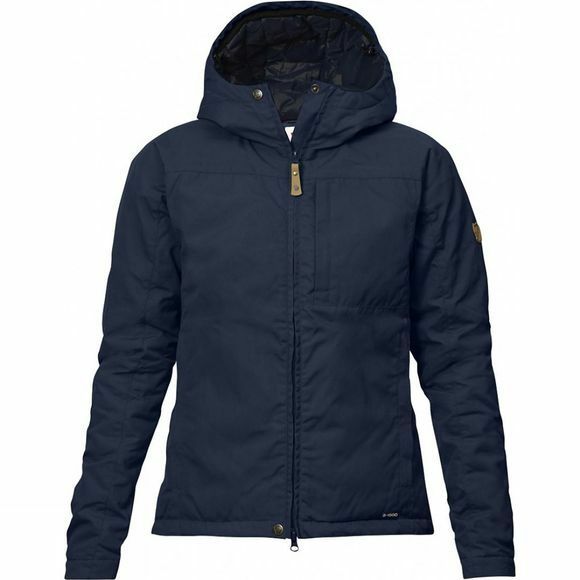 The Women's Kiruna Padded Jacket is a comfortable and versatile everyday jacket for the colder months of the year. It is made from hardwearing wind and water resistant G-1000 fabric and lined with pliant recycled nylon, and lightly insulated with synthetic G-Loft Supreme that feels like down and provides excellent insulation, even when damp. A timeless model that is just as suitable for travelling to and from work as it is for weekends spent in the outdoors and mountains. The cut is hip length and it has a fixed, adjustable hood that provides warmth around the neck and head when the wind picks up. The front opening has a two-way zip with an inside protective flap, and press buttons at the hem and chin. There is a chest pocket and two hand pockets, all with zips. Side panels with gussets under the arms give extra freedom of movement.